Jaipur is a beautiful city in the land of the setting sun. For learning more about the culture of Rajasthan, head towards Jaipur. This Jaipur City Tour is designed for those who loves to explore the historic side of Jaipur. 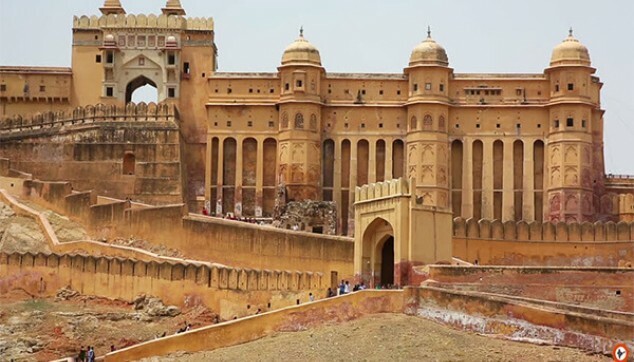 The tour to Amber Fort, the City Palace and the Hawa Mahal will unravel a lot about the city. On this tour you will hear the tales about the history of these places. Your mind would soon go into the era when the rulers used to live in these forts. You will start envisioning their ride on the horses, their battles, their triumphs and their failures. After diving deep into the history of these forts moves towards learning the Rajasthani cuisine. Head towards a cooking session on this Jaipur Culinary Tour. Meet a local family of Jaipur, have great conversations and start the process of preparing Rajasthani cuisine. Finally, have a nice lunch with them. Layer by layer, place by place discover the true beauty of Jaipur. Explore the wonderful architectures of Amber Fort, Hawa Mahal, Jal Mahal and the City Palace. Enjoy an elephant safari at the ramparts of Amber Fort. 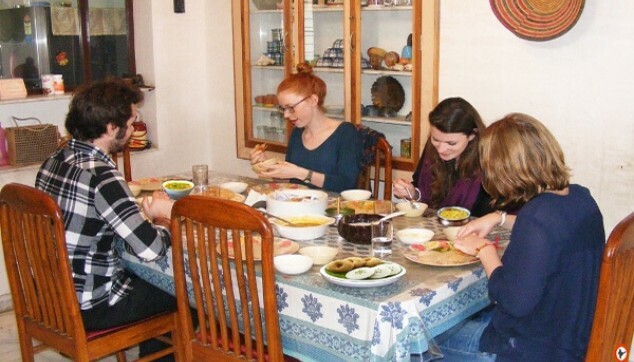 Chance to meet a local family on this Jaipur Cooking Classes Tour. Learn the art of cooking delicious Rajasthani food. Jaipur City Tour with Cooking Class will start at 8:00 am. You will be received from the hotel. From here drive first towards the Amber Fort. On your way, take a look at the city’s local happenings. After stepping down from the car have a glimpse of the Amber Fort. Now, enter into a new colorful world of Rajasthani culture, tourists taking photographs in different poses and elephants ride going all around. In this cheerful set up, take the elephant ride up the hill to the fort’s main entrance. Visit the Jai Mandir temple inside the fort and enjoy the look at Jaipur city from the fort. Also, enjoy the reflection of the fort in the lake surrounding it. After capturing these spectacular views in your camera. Head towards Jal Mahal, a Rajput style water palace in the Man Sarobar Lake of Jaipur. Relax, enjoy and click photos while taking a view of this beautiful Jal Mahal (Inside visit to Jal Mahal is not permissible). Post this, drive to enjoy the charms of Jaipur’s Hawa Mahal. The historic monument is the result of the fruits of the vision of Maharaja Sawai Pratap Singh. Here explore the blend of two different architectural styles-Hindu Rajput plus the Islamic Mughal architecture. Also, learn more about the Rajputs way of living by visiting this historical place. The next destination on the list is the City Palace. Enjoy the courtyards, gateways and gardens of this palace. Explore the wide collection of art, carpets and old weapons at this Palace. Post this, head towards a local family home in Jaipur where you will have a chance to meet the local family and spend some time with them. After some chit chat, time is to learn about the delicious Rajasthani food. Your host would explain all about the ingredients and recipes, and you can take part in this interactive cooking session. This will be followed by a lunch with the family. Later, you will be driven back to your hotel in Jaipur. It was a unique experience to learn cook with the Indian family. The hosts were very hospitable and shared a very good time with us. Also, I loved the Indian food cooked which was amazing.